The rechargeable battery inside the helicopters can overheat, posing fire and burn hazards to consumers. This recall involves about 685,000 "Sky Scrambler" and "The Sharper Image" toy helicopters. The helicopters have yellow, red, or blue decals. BH26047 is printed on the Sky Scrambler's tail. "The Sharper Image" is printed on the tail of "The Sharper Image" helicopters. Mass merchandisers, department stores, drugstores, and other retail stores nationwide, and on the Web from June 2007 through May 2008 for about $20. 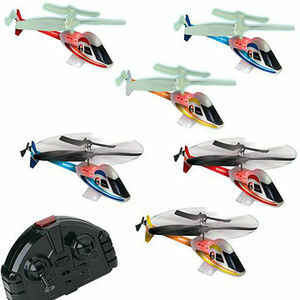 Take recalled helicopters away from children immediately and contact Innovage for a full refund. For more information, contact Innovage toll free at (866) 672-2630 between 7 a.m. and 7 p.m. PT Monday through Friday, visit their Web site at www.innovage.net and www.copterrecall.org, or e-mail returns@copterrecall.org.